Wowza. It’s Friday again. Whoosh – that week just flew by. But every Friday, we try to write like we believe we can fly (Lisa-Jo’s fine words). So I’ll give it a whirl, one more time. Take a prompt. Set a timer. GO. Write. STOP. And see what comes out. Try it, you’ll like it. And check out a few others who’ve got it going on over at The Gypsy Mama’s place. I got some grit between my toes today. Yes, I surely did. It was bright and beautiful here. And I had a ton of errands to run. But not so many that I couldn’t take a break at lunchtime and run down to the beach. I went to the slough – an engineered salt water river and estuary that draws the water birds, by the hundreds. And I walked right down onto the sand with my camera in hand, and I started pointing and shooting. In a big, big way. what I need is a little bit of that gritty stuff between my toes. And some time with the birds. I don’t know a whole lot about them, but I surely do love to watch them do their bird thing. They know exactly what to do. And they know when to do it. They don’t wonder if they’re living up to their potential. They don’t try to be anything other than what they are. They do what their Creator designed them to do. Every moment. Of every day. And they do it with beauty, grace, humor and a fair amount of noise. Lord, help me to be exactly who you’ve made me to be. Nothing more. Nothing less. And help me to do it with grit between my toes. Writing time, exactly five minutes, including fixing two spelling errors. Where the slough comes from the ocean. The ‘big picture’ of the major sand bar, the eucalyptus grove, the Goleta hills behind. A gathering of gulls, all facing into the warm sunlight. Cormorants cooling it on some old pilings, watched over by a great blue heron. A trio of pelicans, resting on a sand bar. A great blue begins to circle around, seeking out his particular nest among the dozens of 100# twig collections in the tops of those trees. …and then settles right in at home. See that greater egret over there by the cliff? He’s my favorite. Except maybe for this guy – a male red-breasted merganser. But that tall one, back there in the shadows. He’s fascinating, don’t you think? Sort of a stately guy. And I’m eternally grateful to him for flying, just for a moment. And for staring at himself in the mirror…oh wait, I think he’s looking for lunch! Yup, he’s goin’ for it! Nah – way too risky! Got one shot with a full reflection – what a gorgeous creature. “They do what their Creator designed them to do. Every moment. Of every day.” This is my prayer, that might live this life doing exactly what He created me to do. Thank you for this. Your images made me long for the beach. It’s been too long since I sifted sand between my toes…. God bless you, friend! I would love to have a GRIT day like yours! So very wanting too. Beautiful capture of a fantastic spot! I really don’t like grit between my toes … but would love a cup of tea with you, while enjoying this amazing view. Glad you found a moment of rest, Diana. Love the west coast. I am an east coast gal. I go to school in Oregon and arrive in Cannon Beach on Monday. Being there does something for my soul. Somehow academic work in contrast to the beach gives the balance needed to absorb all the info. Thanks for the reminder. Beautiful. I do this too, take my camera and walk in the sand or in the park or around my neighborhood to get perspective. And how I love those birds. The cormorants at our cottage in Canada have devoured an island, not too fond of them now. Lovely photos, thanks for sharing them. What amazing photos! You’ve got a whole bird sanctuary there! 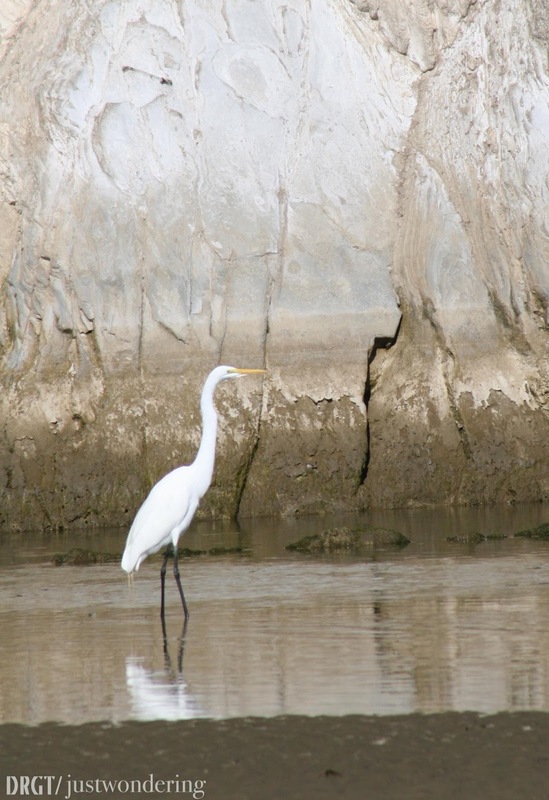 I love the shadow the egret casts–so much larger than he is. And yes, I remember the Steve Martin/Egyptian routine. You must have been all of 5 years old when Steve was doing that schtick! What I loved in one of those egret pics was that the rock behind him echoed his long neck and head pointing right. I find camera jaunts intensely refreshing. Somehow looking for the shot – out at the big scene in front – and then choosing where to focus through the SLR – it brings joy and centeredness. I’ve lived in CA almost all of my life, but until we moved to Santa Barbara 15 years ago, I never had easy access to the beach. We lived about 60 miles of freeway driving away from the closest one and we didn’t go there often. I think maybe that’s why we started vacationing in Hawaii with some frequency. Being near that water and the life that surrounds and inhabits it, it’s just so nourishing somehow. And I think you’re right on about the combo of beach and intellectual absorption – great combo. This is the first time that’s I’ve ventured down onto the sand to take photos – why, I’m not sure. I usually stay up in the parking area at different points and shoot from there. But yesterday, that sand was callin’ my name! And I’d be glad to provide the tea anytime you want to come west, Glenda. I love this Diana. Watching birds (which I dearly love to do) has taught me the same lessons. They simply trust the Father to care for them and do what they were created to do. We have a lovely Egret in the man-made pond just down the street from our apt. complex. I have no idea how she ended up here, but I love to watch her. She stands out majestically against the ducks and grackles! Thanks for stopping by, Linda – I’m always so happy to see your sweet face. How’s the work on the house coming – you are building one, right? Or have I confused you with another Linda out there? 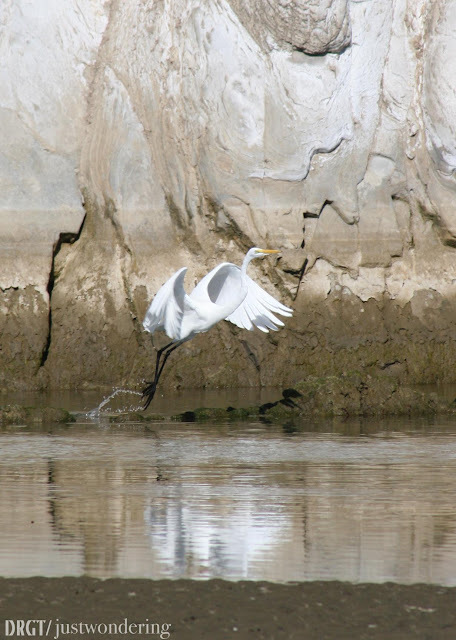 If you are the right person, maybe you can persuade that egret to make the move with you – wouldn’t that be lovely?? Love the shore birds. Love your photos of the shore birds. Couldn’t hang with the grit between my toes, though…. Schedule your California tour, Patricia! Wow, what a blessing to get grit in ones toes this time of year. All we’ve got ‘tween our tootsies are bits of wool. 😉 The flying image and the hollow part created by the perfect fold of the wings–so akin to God’s hiding place for us. Beauty. thanks for your encouragement, friend. it’s my prayer, too. i am SO much a beach/ocean person and I’m blessed to live near enough to be there in 5 minutes. Thanks for stopping by, Mumsy. Hope you can find your own kind of grit day soon. Well, if you wore Nikes, you wouldn’t have to deal with the grit. I happened to have sandals on that day – so I got a little. And I really don’t mind a bit. I actually like sand – except for walking a long way in the soft stuff – that is no fun. But a little of that and then a lot of hard=packed sand – yeah, I like that a whole lot. I do appreciate the life that is ours here on the left coast. It gets cool and damp, but we don’t deal with snow, we seldom deal with freezing weather. Just a lot of fog at all times of the year. But when the sun is out – oh, my!!! – it’s one of the most gorgeous places on the planet. And I know it’s a gift to be able to live here. Even after these years here, I still pinch myself sometimes: Do I really get to be in this place always?? It stuns me still. I loved that hollow space there, too – so nice of that big ol’ bird to cooperate!